This is my first ever blog so I hope this works. As many of you know I own a 1973 MGBGT and have owned it since I was 14 years old. I love the look of the MGBGT, I think that the body styling is timeless, however this is about where my love for MG's stops. 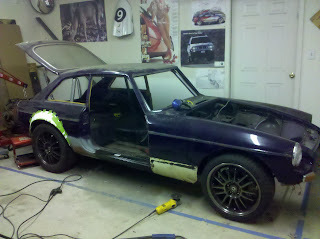 Since there are plenty of MGB's laying around all over the world I hope the MG purists will understand that for this car the only thing MG about it when I get done will be the body, literally. 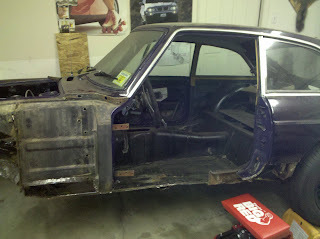 Originally I was going to utilize the original front cross member for the base to my front suspension. I had welded in motor mounts and was fitting a 302 here. After a year into the project I realized I wanted to do this thing from the ground up so I basically started all over have spent quite a bit of time re-doing and removing everything. 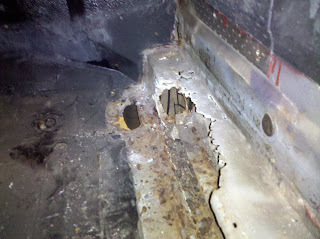 The rocker panels on this car, as many MG's out there were, are completely rotted. I purchased replacement panels, easy right? This is the readers digest version of this job. 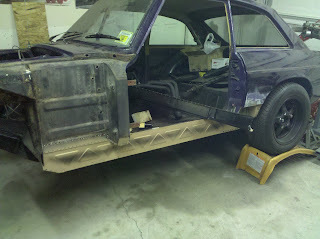 I removed the rear suspension and compared it here to 8" Ford out of a 66' Fairlane that I'm going to use in place. 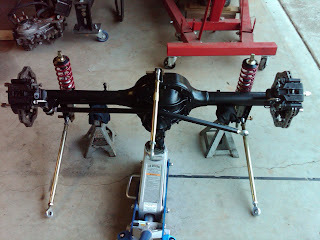 Here is the shortened Fairlane rear end with the 3-Link I designed for the car. Here it is in the car. The original front suspension was a beast. 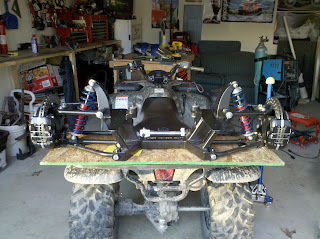 I actually purchased this front subframe from Fast Cars Inc. I started designing my own, but the cost actually was going to be about this same and this was exactly what I was looking for. It weighs 80 lbs. 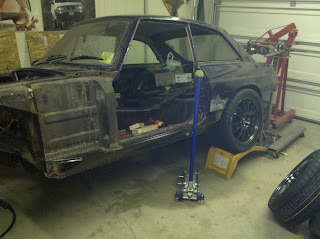 less than the original front suspension, and most of that is unsprung weight. 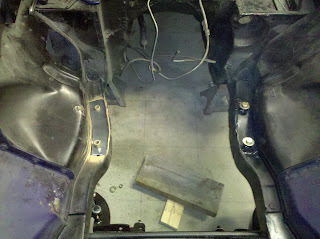 When I went to install the new front suspension I found the frame buckled and the mounting holes for the front subframe so far out that the left side wheel was 1.5 inches closer to the rear than the right side. Naturally I built a frame straightening rig out of two I-beams and two bottle jacks in my garage. I actually got it stretched back to within straight by a 1/16th of an inch. 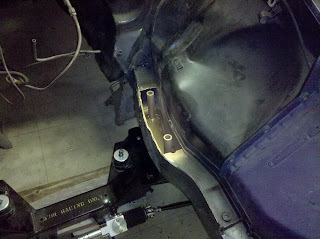 I then welded in 1/8 inch plate on either side of the frame where the buckle was. 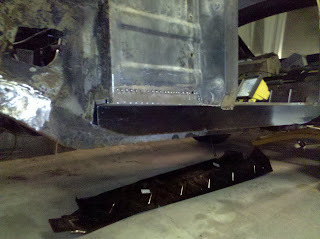 The subframe mounting points were tubes welded into the frame rails, where they were welded into the frame, the frame was buckled and bent. 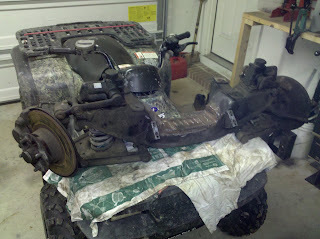 I decided the best way to repair this was to section the frame and make new tubes and weld in new upper and lower frame sections. It worked actually quite well. 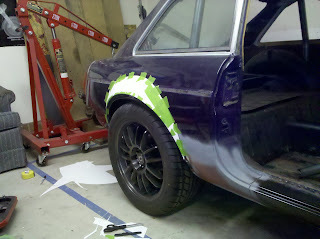 Now that it is a rolling chassis I am mocking up the fender flares and building my roll cage. Fun stuff. Thats it for now, I really cut a lot out to keep it from being too long. I will add more stuff as I go. Question for ya! 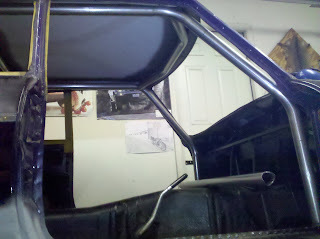 And I am new to life so bear with me here; What are the specs on the roll cage material? I found your blog via mark sawatsky's MGB V12 site, I noticed his cage is made of something that looks like it's meant to laugh in the face of marauding monster trucks (effective, but ugly). 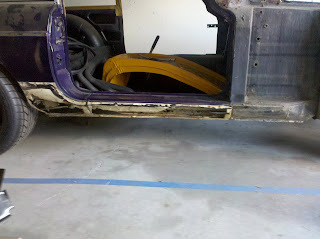 I'm hoping to put in m own roll cage, and I like how discrete yours is, so I was just wondering what kind of pipe that is and how effective do you think it would be, should the car actually roll (God forbid!)? I don't think Ivan checks his old posts frequently. Shoot me an email at david@beaterblog.com and I'll put you in touch with Ivan.